Get four groups into a line with one bucket of water on the end. 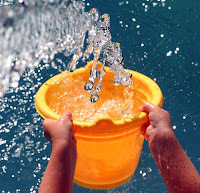 Have small cups used to pass down the water to the opposite end of he line and fill up an empty bucket. The first line done wins.